Doctoral student Kevin Ryan (seated) developed a machine learning model to predict new chemical compounds. Standing are Professor Michael Shatruk (left) and graduate student Jeff Lengyel (right). 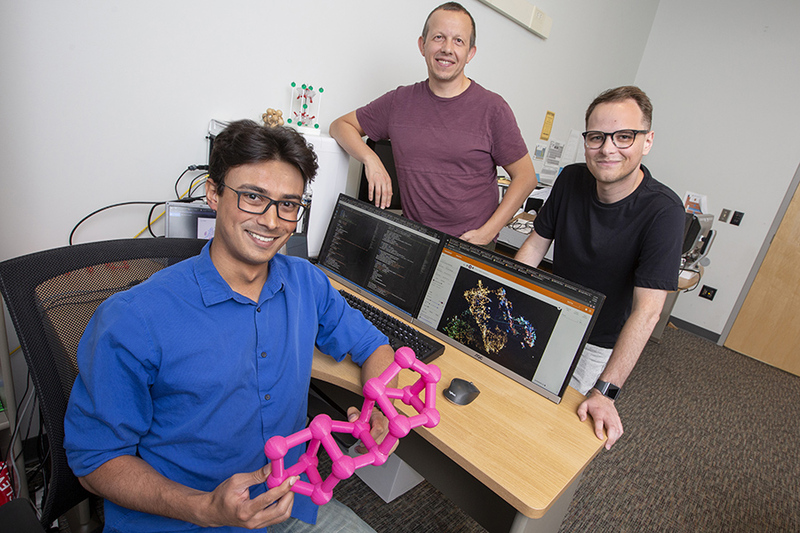 A team of Florida State University researchers is using artificial intelligence to identify which among hundreds of thousands of hypothetical crystal structures can result in the prediction of new chemical compounds. It’s a move that could radically change how chemists identify, test and study potential new compounds for any variety of materials, medicines or other products. Kevin Ryan, Shatruk’s doctoral student, developed a machine learning model that relies on a neural network — the same technology that powers Google maps or voice recognition software — that could analyze existing crystal structures of inorganic materials and use that knowledge to predict new chemical compounds. The research is published in the Journal of the American Chemical Society. “What it’s doing is creating a model based on knowledge of crystal structures to understand how chemical elements could bond into new structural arrangements to make a new material,” Ryan said. The researchers trained the network on more than 50,000 crystal structures without giving it any other sort of knowledge or data about chemical theory. The computer learned chemistry from the geometrical arrangements of the atoms. In addition, they allowed the network to learn the atomic arrangement by using a movable virtual probe. The system basically has 12 virtual eyes around each atom to give the network multiple angles of the structure, thus conveying the 3D information. To test the model, Ryan trained it on a data set, then tested it on a subset of crystal structures that it had never seen. The researchers found that the network could recognize similarities within groups of elements. “The model is learning what configurations make sense for oxygen, what makes sense for carbon and so on,” Ryan said. The neural network model could provide guidance for synthetic chemists as they are trying to discover new compounds. According to Shatruk, the traditional method is more of a “shake and bake,” where scientists go straight to the lab to experiment with heuristically derived chemical compositions they think could potentially form new structures. “With the neural network model that Kevin developed, you give it all this information and it makes its own predictions based on its own parameters,” Shatruk said. Ryan and Shatruk co-authored the paper with FSU graduate student Jeff Lengyel. The research was supported by the National Science Foundation and Oak Ridge National Laboratory.